Europe-based NGO “Cofadise-Mapeti,” a group gathering families of missing and kidnapped Moroccans in Tindouf prisons called for lifting the siege imposed by the Algerian regime and the Polisario on the people forcibly held in the Tindouf camps in south-western Algeria. President of the group, Miloud Khelil addressed to the president of the Euro-Mediterranean Network of Human Rights (EUROMED-Rights) a letter to express his solidarity following the ban imposed by Algiers on members of the Euro-med network to visit Algeria. The network members wanted to visit to enquire on the serious violations committed by Algerian authorities against human rights activists in that country. He said the ban also affects members of his group whenever they ask permission to go to Tindouf to investigate on the fate of “our fathers, children or our family members” who have not given sign of life in the camps of Tindouf for years. “Algeria does not allow anyone to access these places for fear of being unmasked,” reads the letter that was relayed by MAP. “These Sahrawis, abandoned by the international community do not enjoy any of their refugee rights and do not enjoy any freedom of expression and association,” says the letter. 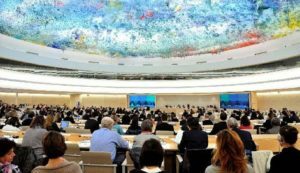 Last Thursday, another NGO, “African development,” denounced, before the UN Human Rights Council in Geneva, the precarious living conditions of the Tindouf camps’ populations that have no status, in the absence of any registration or census. Two days earlier, two other NGOs had drawn the attention of the UNHRC on the repressive practices against all those who dare oppose the Polisario’s separatist thesis, in a climate of total impunity. The NGO Il Cenacolo and the Agency for International Development (AID) have listed before the UNHRC several cases of arbitrary detention and enforced disappearance and the repeated violation of all legal framework.